Publisher's synopsis: Love is in the air this Christmas! 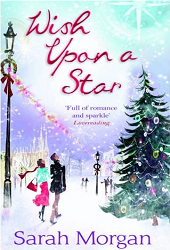 My thoughts about Wish Upon a Star, Sarah Morgan's latest publication is actually two novellas, each having been published in the UK prior to their combining for this book. I had a really hard time with both of these stories, I found them just too predictable and the plots too weak. So, since Wish Upon A Star just wasn't for me, I googled around and found a nice and fair review by someone who did enjoy the two stories. Please go here to read a great review for Sarah Morton's stories. This e-galley was provided to me by the publisher and in no way affected my honest and fair review.